The ideal parking lot should, if at all possible, be devoid of puddles shortly after the rain stops falling. If you end up with puddles of standing water lingering on your parking lot long after the storm ends, this can indicate several different problems with the asphalt or its foundations. It’s important to troubleshoot these puddles as soon as possible so they don’t lead to further (and more expensive) water damage. 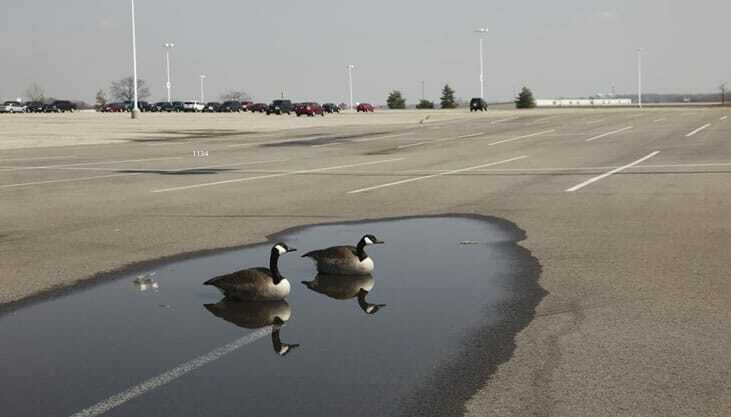 Sometimes the puddles are caused by poor parking practices. If heavy equipment or vehicles heavier than the recommended weight limit for the parking lot are left in the same position on the parking lot day after day, they will compact the asphalt, making depressions on the surface. These ruts in the parking lot allow water to collect and work its way into small cracks, which can cause even more damage. These are sometimes due to poor or uneven compaction during the paving process. The sub base or foundation underneath the actual asphalt needs to be evenly and smoothly compacted before the asphalt is installed. A well compacted sub base leads to a smoother, stronger asphalt surface that is less prone to grade depressions and rutting in the future. During installation, asphalt pavers should also ensure that there is appropriate drainage through correct slope, grade and drains. In some cases, installing porous asphalt is an option. These things ensure that water drains off and away from the pavement after a storm passes. Dealing with puddles in your parking lot depends on the underlying reason for the puddling, as well as the extent of the puddles. If puddles are allowed to remain, water can seep down into the sub base through small cracks. Once there, the water is subject to the freeze – thaw cycle from fall through early spring. This will push and pull on and weaken the asphalt until cracks get bigger, turn into alligator cracking and eventually become potholes. There are several things that can be done to improve the pavement and reduce damage from puddles. If the parking lot is in solid shape and suffers from puddles due to ruts from poor parking habits, patching is an option. A strip of pavement could be milled and a new surface installed. Minor rutting from cars can also be helped by Infrared treatments can be applied where puddles have formed, followed by sealcoating application. This will improve the surface of the asphalt and protect it from water infiltration. Porous asphalt is not a patching option, but if you are at the point of installing a new parking area, the sub base, drainage system and porous asphalt can be installed to prevent puddling in the first place. Contact Espina Paving today if you’re struggling with puddles in your parking lot. Call us at (703) 491-9100 and we’ll examine the underlying cause of the puddling and come up with a solution that will save you money and help your parking areas last longer, with fewer problems.